On Friday, December 7, at 8:00 p.m., the St. Ann Choir will sing an Ordinary Form Latin Mass (Anticipated) for the Solemnity of the Immaculate Conception, with the Gregorian Chants for the feast and Mass for Three Voices by William Byrd, at St Thomas Aquinas Church in Palo Alto, California. The church is located at 751 Waverly St. at Homer. 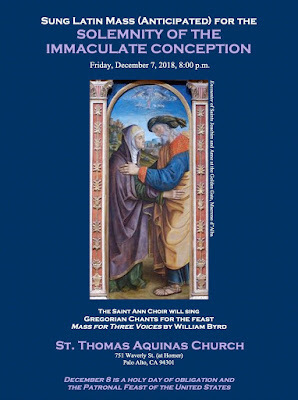 December 8 is a holy day of obligation and the Patronal Feast of the United States. The parish of Ss Peter and Paul in Wilmington, California, which is administered by the Norbertine Fathers of St Michael’s Abbey in Silverado, will have a Solemn Mass in the traditional Roman Rite for the feast of the Immaculate Conception. The Mass will begin at noon; the church is located at 1015 Lagoon Avenue. 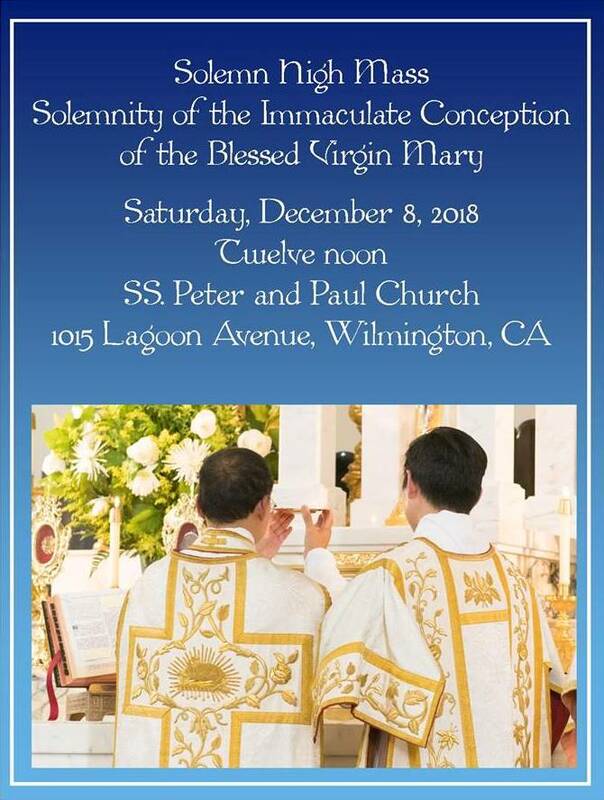 The Mass is also part of the Consecrate California event, (https://www.consecratecalifornia.com/) praying to defeat the culture of death, for the sick, elderly, and unwanted, and for an end to the violence caused by substance abuse, human trafficking, etc.